The 38 metre motor yacht Showtime, listed for sale by Ken Denison at Denison Yachting, has been sold with the buyer introduced by Richard Gray at IYC. Built in aluminium by US yard Broward Marine to ABS class, Showtime was delivered in 1989 with refits in 1995 and 2015 and remains in class today. Accommodation in an interior designed by Susan Puleo is configured for eight guests in four cabins comprising a main deck master suite, VIP suite, a double and a twin, all with entertainment centres and en suite bathroom facilities. In the full-beam main saloon there is a dining area aft with seating for up to eight guests at an extendable table and there are lacquered wood cabinets for storage of glassware, china and cutlery. Forward is comfortable seating in recently upholstered settees of soothing cream hues in front of a large curved Sony television. The large aft deck is well equipped for al fresco entertaining and dining with built-in upholstered seating, a table and a full wet bar. Up in the skylounge, the facilities on offer are sure to make it the go-to area for pre-dinner drinks, offering a full wet bar with stools, comfortable seating and an entertainment centre including a Samsung flatscreen television and a stereo surround sound system. Outdoors, the upper deck features a garden area with wooden seating, ideal for quiet moments or intimate conversations. 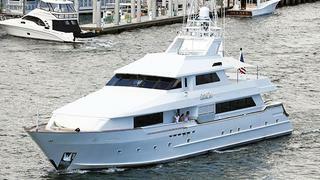 Twin 1,400hp Detroit Diesel engines allow a cruising speed of 15 knots and a maximum speed of 17 knots.